When the wireless door lock and unlock functions operate, the communication circuit between the door lock receiver assembly and certification ECU (smart key ECU assembly) is normal. When the entry lock and unlock functions do not operate, radio wave interference, a customized entry cancel function, or a communication error between the key and vehicle in the smart communication circuit, is suspected. Entry function cancel is off. Entry function cancel is on. 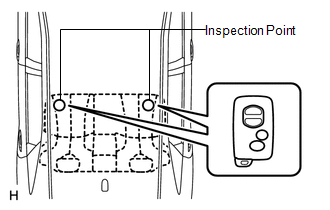 (a) Move the key as described below and perform the operation inspection. When the key is brought near the door outside handle assembly or outside electrical key oscillator, the possibility of wave interference decreases, and it can be determined if wave interference is causing the problem symptom. The transmitting waves of the wireless functions and entry functions are the same, but the wave logic is different. Therefore, it is possible that only the wireless functions or only the entry functions are affected by wave interference. 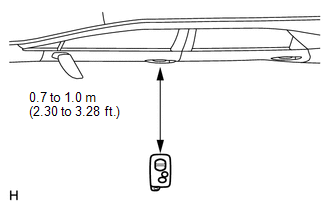 (b) Bring the key near the driver door outside handle assembly, and perform a front driver door entry lock and unlock operation check. 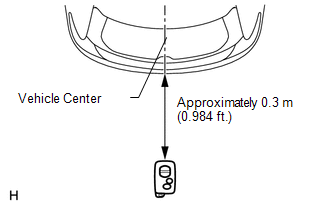 If the key is brought within 0.2 m (0.656 ft.) of the door outside handle assembly, communication is not possible. 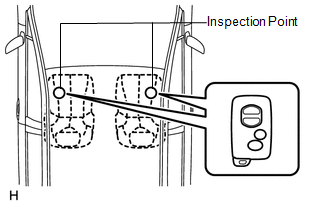 (c) Bring the key near the front passenger door outside handle assembly, and perform a front passenger door entry lock and unlock operation check. (d) Bring the key near the outside electrical key oscillator (for rear side), and perform an entry back door open function check. 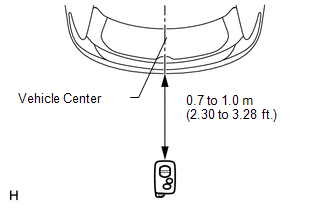 If the key is brought within 0.2 m (0.656 ft.) of the rear bumper, communication is not possible. 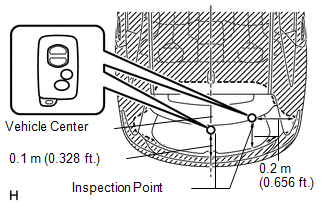 If the inspection result indicates that the problem only occurs in certain locations or times of day, the possibility of wave interference is high. Also, added vehicle components may cause wave interference. If installed, remove them and perform the operation check. Entry function does not operate for all doors. Entry function operates for all doors. Entry function operates for an individual door. (4) Enter the following menus: Body Electrical / Smart Key / Key Communication Check / Overhead + Driver Side. 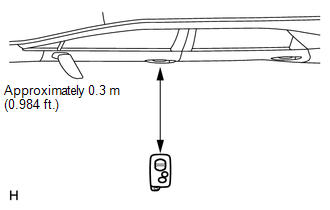 (5) When the key is in the position shown in the illustration, check that the wireless door lock buzzer sounds. 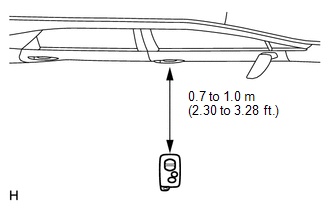 (4) Enter the following menus: Body Electrical / Smart Key / Key Communication Check / Overhead + Passenger Side. (4) Enter the following menus: Body Electrical / Smart Key / Key Communication Check / Overhead + Front Room. (4) Enter the following menus: Body Electrical / Smart Key / Key Communication Check / Overhead + Rear Room. (4) Enter the following menus: Body Electrical / Smart Key / Key Communication Check / Overhead + Back Door (inside). 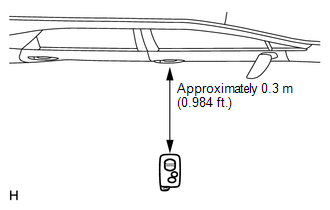 (5) When the key is held at the same height as the rear bumper upper surface and aligned with the center of the rear of the vehicle, check that the wireless door lock buzzer sounds. (4) Enter the following menus: Body Electrical / Smart Key / Key Communication Check / Overhead + Back Door (outside). Wireless door lock buzzer does not sound for all electrical key oscillators. Wireless door lock buzzer does not sound only for either door electrical key oscillator. Wireless door lock buzzer does not sound only for one indoor electrical key oscillator. Wireless door lock buzzer does not sound only for outside electrical key oscillator (for rear side). Wireless door lock buzzer sounds for all electrical key oscillators. (a) Check if another registered key is available. Another registered key is not available. Another registered key is available. (a) Register a new key (See page ). (a) Using the key registered in the previous step or another registered key, check that the entry function operates normally (See page ).